The liver is one of the largest organs in the body and is often loaded with numerous tasks to help keep the body in its normal function. Actually, it performs over 400 functions!!! That’s a lot of work for one organ, right? This organ generally sifts everything that comes inside your body, keeps whats important, and gets rid of harmful waste materials and toxins. With all these functions, the liver may become overwhelmed and you may end up felling sluggish, suffer from headaches, gain a lot of weight, tire easily, have digestive problems, skin disorders, or even pain on your right side. This doesn’t sound good at all. To prevent all these problems, your liver will need a full detoxification. By detoxification, we are simply talking about inducing the liver to forcefully-remove all the accumulated fats , old cholesterol deposits, poisons, drugs residues, gallstones, as well as toxic waste from the body. 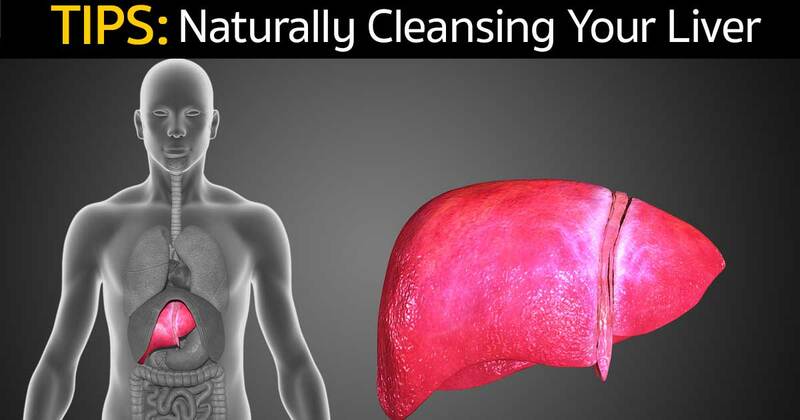 This article will list the top 5 ways in which you can easily cleanse your liver naturally. If you are consuming a diet that is high in processed foods, you are putting the health of your liver and the entire body at risk. Processed foods such as white sugar, white flours, packaged food, and all types of junk foods are notorious for overloading the liver as they contain large amounts of toxins and waste. Do not consume meat and dairy products from animals fed with genetically modified feed as they are packed with herbicides, pesticides, antibiotic drugs, hormones, steroids, and other medication residue. Likewise, alcohol, soft-drinks, juices, and all energy drinks are heavily packed with toxins. Alcohol is known for causing liver damage. Make a point of consuming fresh fruits, green leafy vegetables,meat from grass-fed animals, whole grains, nuts and seeds, and drinks loads of clean, fresh water. There are three types of herbs that are praised for their powerful liver-cleansing capabilities. They include Milk Thistle, Dandelion Root, and Turmeric. Milk Thistle is considered as the “king” of detoxifying herbs. With its powerful cleansing properties, this herb helps eliminate the build-up of highly toxic heavy metals, prescription medications, dangerous environmental pollutants, and alcohol in the liver. Many studies have also reported that Milk Thistle boosts glutathione, an antioxidant in the body that helps cleanse the liver and cells. If you cannot get the herb in its natural form, you can use its supplement. Typically, taking approximately 150 milligrams is just about enough. Dandelion Root is another herb that works magic on your liver. The herb is packed with potassium and various compounds that are known to act as diuretics, thereby triggering your liver to release toxins. These compounds also help the gallbladder to release bile juice. In addition, it has numerous other benefits to the body including strengthening the immune system, relieving digestive problems, balancing blood sugar levels, reducing and soothing heartburn. Turmeric has been shown to contain large amounts of antioxidants that support healthy liver tissue and liver metabolism. It helps reduce inflammation in the liver, GI tract, as well as on the colon. For a full liver detoxification, take about 1000 milligram of turmeric on a daily basis. Your emotions affect the way your liver functions. According to Ancient Chinese Medicine, the kind of emotions you experience can directly affect certain body organs such as the liver. In other words “toxic” emotions can do a lot of harm to your liver as they literally obstruct its operations, thereby causing irregular activity, which can lead to build-up of waste and toxins. If you are struggling with frustration from work, home, business, or people, you need to find ways to cope as such strain is toxic for your liver. Remember that when you are stressed, your whole body is under intense pressure; and so is the liver. If you have any resentment towards your co-workers, spouse, relatives, or even friends, your feelings tend affect the overall function of your liver. Work on getting rid of these toxic emotions. Additionally, practice gratitude by appreciating who you are and your achievements. Work on bringing joy into your life by relating well with other people, sharing, reading self-improvement books, the Bible, and do all those things that will free your body and soul. By working on building good emotions within yourself, you will boost the health of your liver as well as the entire system. Many decades ago, ancient health practitioners recommended regular consumption of beef and chicken liver as a way to help overcome liver toxicity and other health complications. In fact, Weston A. Price, who was a famous dentist discovered that liver supplementation was very effective in treating gum and liver diseases as well as other illnesses. He recommended raw liver supplementation and liver capsules, both of which showed great results in his patients. If you do not eat liver, you can simply purchase desiccated liver tablets at your local food store. There are certain foods that act as excellent liver detoxifiers. Vegetables are especially ideal for a liver detox as they contain antioxidants, important nutrients and high-fiber content which hasten the elimination of toxins from your body, thus easing said burden on the liver. Include fruit and vegetable salads in your diet, sprouts, as well as probiotic-rich foods such as yogurt, kefir, kimchi, sauerkraut, beets, dandelion greens, cucumbers, tomatoes, and artichokes. Garlic is also helpful as it contains numerous sulfur-containing compounds that flush out toxins from the body. Grapefruits contain vitamin C and powerful antioxidants that boost the production of liver detoxification enzymes in the liver itself. Green tea is rich in catechins, an antioxidant that has been shown to eliminate fat accumulation and promote good liver function.Do not forget to drink about 6 to 8 glasses of water everyday as it supports the liver by helping flush out toxins in the body. With a little effort and dedication, you will be able to keep your liver healthy throughout the years. Remember that this organ has many important functions that keep your body healthy and so it’s important that you keep it in shape to ensure optimal performance.